Funny enough, I fell in love with a guy from Melbourne, before I discovered that Melbourne is inarguably the brunch capital of the world. Over the New Year holiday, we spent two weeks in Australia, brunching our way through Melbourne, spending time with his family, cuddling with koala bears, and taking a jaunt to Sydney. Melbourne reminds me a lot of Austin, in that it’s filled with coffee shops, bars, live music, street art, and has plenty of culture—but with a laid back personality. It would be nearly impossible to visit every brunch in Melbs—there are simply too many cafés—but I certainly did try. I’ve pulled together my top brunch spots, curated from about a dozen breakfasts, below. You visit L’Entrecote for café fare in a posh setting, and not for the service, which seems appropriate given that it’s French. The décor is quintessential of a feminine French café: monochromatic Parisian bistro chairs and marble tables decorate the stunning front patio, which is shaded by beautiful greenery. We loved our lattes, the pastries, and the acai bowl. Located on the hip and popular Chapel Street, Journeyman is a go-to spot for Melbourne’s cool 20-somethings for brunch. The sun-drenched, casual café had the quintessential Melbourne décor of oak tables with steel accents and minimalism, giving off major industrial vibes. The coffee is local and top notch, though that’s par for the course in Melbourne. 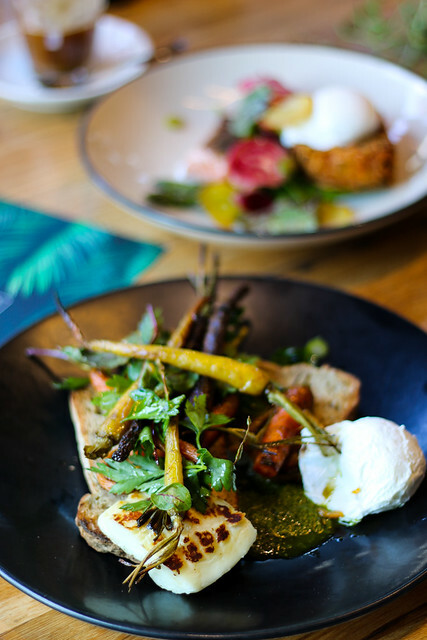 And, while most cafés over brekkie options including eggs on toast, acai bowls, avo toast, poached eggs & potato rosti, the portions and quality of the offerings at Journeyman stood out. We loved the avocado toast with sweet potato crisps and poached eggs, the potato rosti with poached eggs, Parmesan and kale chips, and the blue coconut yogurt with fresh fruit. Matcha Mylbar is a highly Instagrammable vegan café in the impossibly cool St. Kilda neighborhood of Melbourne. 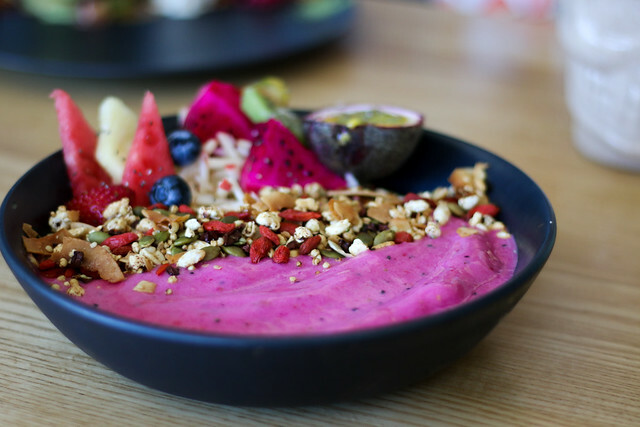 The menu is packed with bright superfoods, with turmeric, charcoal, and bright blue lattes, superfood smoothies served in skull-shaped glasses, and the most beautiful, bright acai bowls you’ve ever seen. This place was top on my list for brunch, and I was not disappointed. 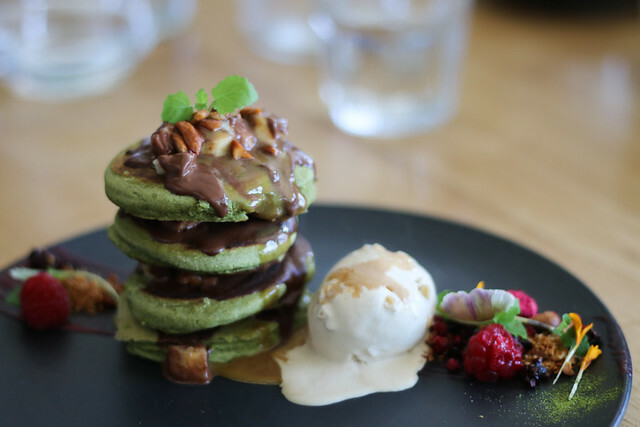 The dairy- and gluten-free Matcha pancakes topped with cacao and served with coconut ice cream. Please note the place is crowded and the service is slow. We almost missed our flight because I insisted upon brunching here—it would have been worth it. 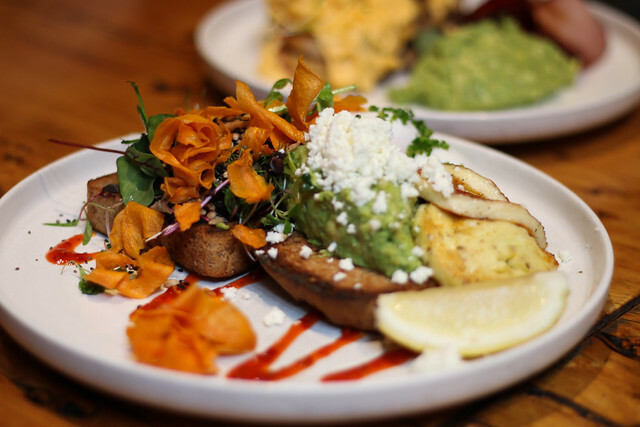 Mr. Zen is one of many brekkie spots in South Yarra, which serve breakfast until 3 p.m. each weekday. Like Matcha Mylkbar, Mr. Zen has a wide variety of healthful lattes, like a fancy chai and a golden Tumeric latte. The winning dish was a plate of salmon and poached eggs served atop spicy corn fritters and drizzled with balsamic. The indoor-outdoor space was decorated as part of a design competition, with white oak tables inside, and modern steel benches outdoors. South Yarra is packed with charming little cafés to breakfast and to see and be seen, among them L’Entrecote, Gilson, and the Botanical, which is certainly the go-to place for the social folk in the neighborhood. Gilson provided chic and bright café has a minimalist aesthetic with feminine, French touches like pale pink walls and Carrara marble countertops. The service was quick and efficient, and we enjoyed brunch here immensely. We loved the coconut and chia seed pudding with mango, and the tomato, basil, and stratiacella salad. Top Paddock is consistently ranked as one of Melbourne’s best brunch spots, and thus it was expectedly crowded upon our arrival. The chic, monochromatic indoor-outdoor café and restaurant has an impressive yet unpretentious vibe, attentive service, and great coffee. It’s definitely a staple brunch spot for the neighborhood. The food was good, but unmemorable—in particular we enjoyed the heirloom carrots, haloumi, and poached eggs.